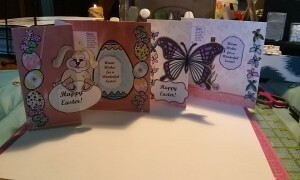 I have made two Easter Sunday cards using the holiday sample puzzle we have posted. I am including a .pdf file with the images I used to make the cards so you can make one too. 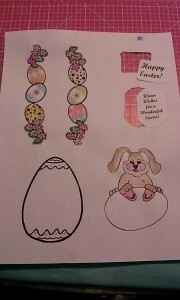 Clipart images for front of card, Bunny or Butterfly, both are included. 1. First I printed the clipart images. I used the watercolor pencils to color in the images. It was easier to cut the images out after coloring them in. 2. After fussy cutting the colored images out, I cut an 8½” x 11″ piece of white cardstock down to 5½” x 11″. 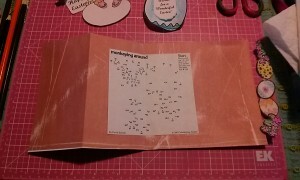 I then attached a piece of patterned paper to the card stock and trimmed off the extra with scissors. I scored the card down the middle at the 5½” mark. I flipped the card over and scored again at the 2¾ mark to make the card tri-fold. When folded flat the card should be a 5½” x 5½” square. 3. Glue or tape the puzzle over the middle of the 5½ fold and carefully re-score the card. This should keep creases from forming on the puzzle. 4. Attach the large egg or cross to the right side of the puzzle, leaving room for the border. 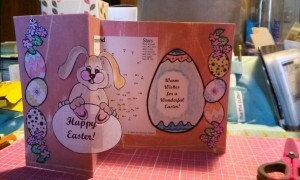 If you place the egg or cross partly over the white section of the puzzle border it will help give depth to the card. Place the borders to the right and left edges of the card. 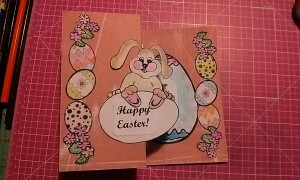 Take the large rabbit or butterfly and place adhesive only on the back left side of it (when you flip it over to tape the back, it will be on the right side). 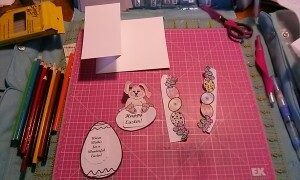 Attach it to the card leaving the right side to hang off the fold. I tried to line up the rabbit and butterfly so the words on the inside of the card did not show unless the card was opened.